For about a year now, BH and I have watched some bike borrowing stations spring up on the route to the kids' school. The ones we have seen mostly have been orange for the bank that sponsors the bikes, and has the right to advertising their mark on them. 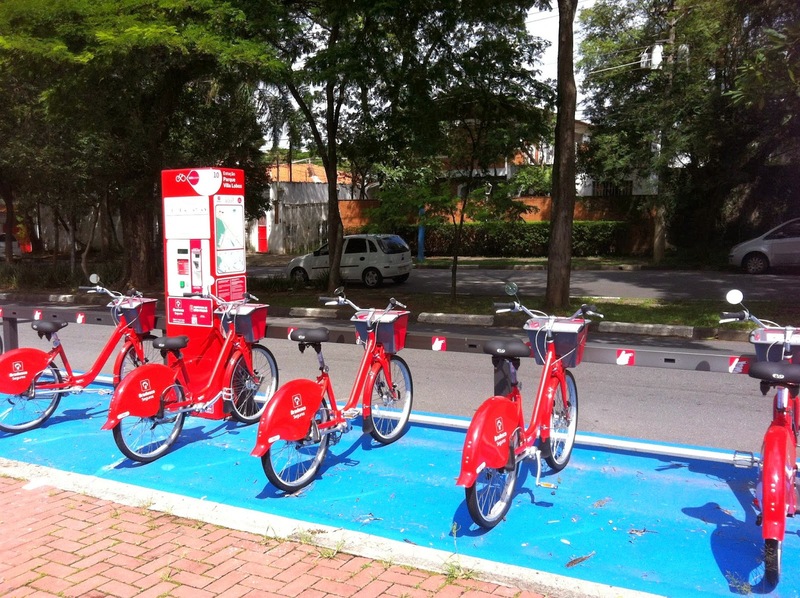 The photo above is of Bradesco bikes, the closest point that has come up near us (maybe three blocks away). Now, here's the trick. You cannot borrow a red bike and return at an orange stand. Or vice versa. Which means you have to loop around looking for the right return place. At the moment, there are more orange stands than red, which means I probably will never borrow one of these red bikes. According to an interesting blog post I read, any company can petition the mayor's office for the right to put in its own "public" transportation stands. Wait for blue or green to show up soon. Of course these companies all want their stands in "areas nobres" or noble areas, or the richy-rich. I'd like to see them put one of these in the outskirts. As the blog post says, it's a great idea, but a terrible system.